Summer holidays are undeniably great fun, but if you’re not careful, it can be easy to get out of shape. A week or two of drinking cocktails and trying out the local cuisine can suddenly throw you off balance, so it is certainly worthwhile putting some time aside to go out for a few runs. Why not add an element of fun to your training by taking part in a virtual challenge that you can even do with your kids? It’s fun, rewarding and will help to ensure your fitness levels don’t drastically decrease – and will make you feel even better when you spend the rest of the day sunbathing by the pool! Whether running is a vital aspect of your life, or you’re just wanting to make sure you stay active throughout your break, below we’ve listed some of our top tips for holiday running. There’s no need to pack all of your running kit as it’s highly unlikely you’ll need it. Instead, just take one, maybe two, sets of kit and buy washing powder when you arrive at your accommodation. Not only will this save luggage space, but as your kit will dry quickly in the warm weather, you will be able to wear it as many times as you want! 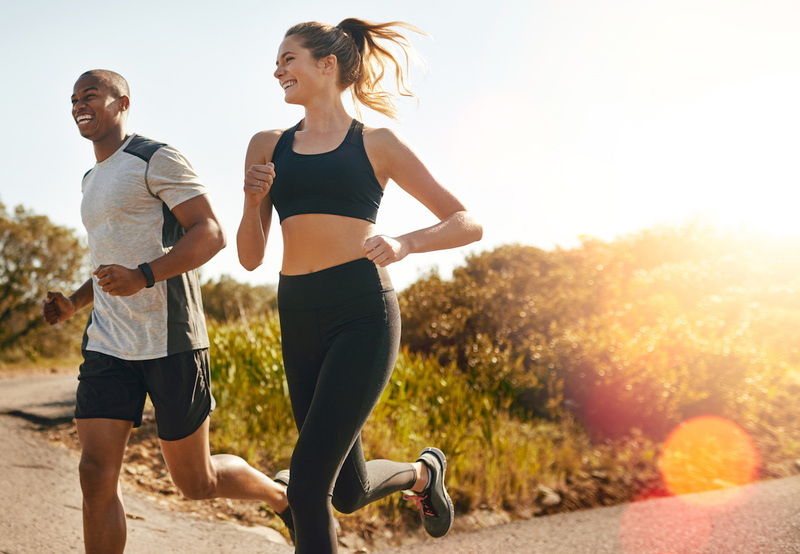 If you’re visiting somewhere warm, you won’t need your base layers, but you will need to remember a cap, sunglasses and some sweatproof sun tan lotion – it’s easy to burn when you’re outside running, even when the sun appears to be hiding behind the clouds! Keeping hydrated is crucial whilst participating in any type of exercise, but it’s even more important to remember to keep hydration levels high when exercising in the heat. As you sweat, the blood volume and fluid within your body decreases, increasing the pressure on your heart to work harder to pump blood round your body. It’s essential that you replace the lost fluids and drink water whilst exercising, but you should also make sure you’re hydrated beforehand so that your body and muscles are performing at maximum efficiency. There’s no ‘best’ time to run as people prefer running at different times. However, if you are going somewhere particularly hot, we’d recommend running early in the morning or later in the evening, so that you avoid running in the hottest part of the day. Running first thing in the morning is often favoured by holidaymakers as it allows you to spend the rest of your day with your family or friends. Although it may seem like you have hours in the day that you don’t usually have, you should remember that holidays are meant for taking it easy and having some well earned time to relax. Plan two or three short runs a week, but be flexible and don’t worry if other plans come up – there’s little point being too rigid and tough on yourself while on holiday, especially if you have children. Rather than aiming to improve your fitness, focus on maintaining your current fitness level and just staying in good shape. One of the best things about running on holiday is the change of scenery. Rather than running your usual route at home, you can enjoy the culture and sights that your holiday destination offers. If you’re especially interested in sightseeing, why not plan your route around the places you want to visit and kill two birds with one stone? Visiting what the village or city has to offer might also give you that little bit more motivation to complete your runs. Or if you’re extra enthused, take your training down to the beach. Running on the sand will increase the number of calories you burn as your body is using extra energy just to keep you stabilised and balanced on the uneven surface. And once you’re finished, you can treat yourself to a post-run dip in the sea to cool off! Wherever you decide to run, make sure you have planned your route before you set off and remember the name and address of your hotel. One wrong turn can disorientate you when in unfamiliar land, and the language barrier will expectedly provide difficulty to communicate with the locals, so make sure you know the address of your hotel. It would also be useful to have your resort’s phone number on your phone and your phone with you, so that you can always contact reception if you really have no idea how to get back to your accommodation. If you’re looking for a challenge to complete whilst on holiday, then look no further than Race at your Pace. We inspire and motivate people to enjoy the outdoors through our highly popular virtual running and cycling challenges. Each month we run awesome challenges of different distances that you can take part in. You have the entire month to cover your chosen distance in however many runs, walks or cycles you like, wherever you like, and whenever you like! And once you complete the challenge, you’ll receive a prestigious medal as a recognition of your hard work and commitment!